Wood (often in the form of charcoal) and dried dung were used as fuel, and a draft was made by means of a fan, "menafah" (Kil. xvi. 7), as in the Orient at the present day. Fire-tongs, "melḳaḥayim" (Isa. vi. 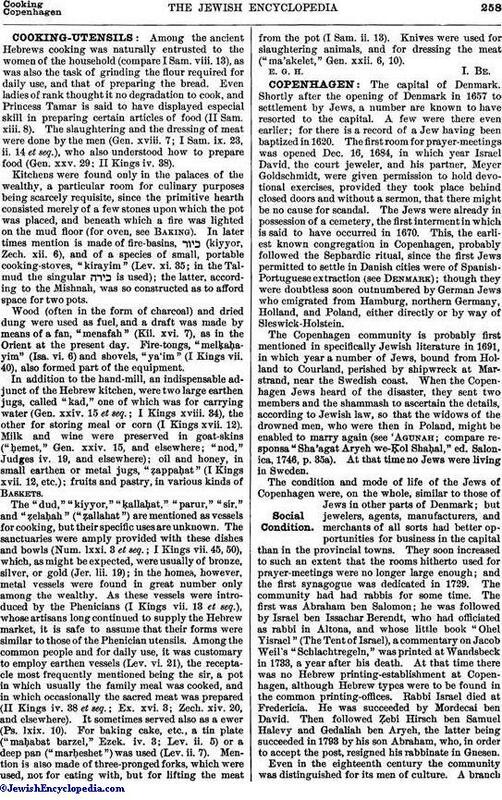 6) and shovels, "ya'im" (I Kings vii. 40), also formed part of the equipment. In addition to the hand-mill, an indispensable adjunct of the Hebrew kitchen, were two large earthen jugs, called "kad," one of which was for carrying water (Gen. xxiv. 15 et seq. ; I Kings xviii. 34), the other for storing meal or corn (I Kings xvii. 12). Milk and wine were preserved in goat-skins ("ḥemet," Gen. xxiv. 15, and elsewhere; "nod," Judges iv. 19, and elsewhere); oil and honey, in small earthen or metal jugs, "ẓappaḥat" (I Kings xvii. 12, etc. ); fruits and pastry, in various kinds of Baskets. The "dud," "kiyyor," "ḳallaḥat," "parur," "sir," and "ẓelaḥah" ("ẓallahat") are mentioned as vessels for cooking, but their specific uses are unknown. The sanctuaries were amply provided with these dishes and bowls (Num. lxxi. 3 et seq. ; I Kings vii. 45, 50), which, as might be expected, were usually of bronze, silver, or gold (Jer. lii. 19); in the homes, however, metal vessels were found in great number only among the wealthy. As these vessels were introduced by the Phenicians (I Kings vii. 13 et seq. ), whose artisans long continued to supply the Hebrew market, it is safe to assume that their forms were similar to those of the Phenician utensils. Among the common people and for daily use, it was customary to employ earthen vessels (Lev. vi. 21), the receptacle most frequently mentioned being the sir, a pot in which usually the family meal was cooked, and in which occasionally the sacred meat was prepared (II Kings iv. 38 et seq. ; Ex. xvi. 3; Zech. xiv. 20, and elsewhere). It sometimes served also as a ewer (Ps. lxix. 10). For baking cake, etc., a tin plate ("maḥabat barzel," Ezek. iv. 3; Lev. ii. 5) or a deep pan ("marḥeshet") was used (Lev. ii. 7). Mention is also made of three-pronged forks, which were used, not for eating with, but for lifting the meat from the pot (I Sam. ii. 13). Knives were used for slaughtering animals, and for dressing the meat ("ma'akelet," Gen. xxii. 6, 10).